The film opens in 19th century Korea, the late Joseon period. A small island off the coast of Seoul, known for the production of high-quality paper, it is commissioned by the court, is visited by the special prosecutor Won-kyu (Cha Seung-won) and his men, after a suspected arson burns down a freighter and its shipment of valuable papers. Soon Won-kyu finds himself embroiled in an island-wide conspiracy and a murder investigation, as those rumored to be responsible for the frame-up and gruesome execution of Commissioner Kang (Cheon Ho-jin) several years ago are killed off in equally horrendous ways: boiled alive in a dyeing kettle, having his skull crushed by a rock, and so on. Neither the old yangban owner of the paper mill (Oh Hyung-gyung) nor his cynical son Kim In-kwon (Park Yong-woo) seems happy to have an outsider like Won-kyu meddle in the affairs of the island. Meanwhile, the beautiful local shaman (Choe Ji-na) predicts an even greater disaster looming ahead for the islanders. "Blood Rain," written by Kim Seong-jae and Lee Won-jae ("City of Violence"), is a well-structured, almost old-fashioned murder mystery transposed to the early modern Korea, a la "Name of the Rose." Director Kim Dae-seung, better known for moody melodramas such as "Traces of Love" and "Bunjee Jumping of Their Own" does a good job of managing what must have been a rather complicated production, with more than a few strong action set-pieces and tightly composed scenes of theatrical confrontations. Tall and sad-eyed Cha Seung-won, a sort of Korean cross between Bill Murray and Nicholas Cage, is okay as a by-the-book police detective oppressed by the memory of his stern father. However, the film's real emotional energy is actually supplied by Park Yong-woo, whose surface cynicism masks a poisonous vat of rage and grief, some even directed at his own class. The film's tone is generally lugubrious and its violence, while never gratuitous (with the possible exception of the oddly deflating resolution in which the characters are literally drenched in blood-red rain), might strike some viewers as excessive, the highly effective computer effects used to render the non-existent entrails and torn limbs notwithstanding. "Blood Rain's" major strengths are its visual scheme, which makes an excellent use of primary colors not usually associated with Korean historical dramas, such as black and red. Production designer Min Eon-ok ("The Story of Chunhyang"), costume designer Jeong Kyung-hee ("Duelist," "YMCA Baseball Team") and cinematographer Choe Young-hwan ("No Blood No Tears," "Seven Days") all deserve kudos for concocting sumptuously stylized but strikingly real-looking vistas of the Joseon dynasty lives. One annoying misstep is Jo Yeong-wook's (or director Kim's) incorporation of classical chestnuts like Rachmaninoff into the movie's score. "Blood Rain" is consistently absorbing but is only moderately successful as a mystery thriller: it ends up relying too much on tired cliches of actors mouthing reams of expository dialogue, and the red herrings thrown about are not very convincing. Many viewers will be able to guess the culprit by the third reel. Still, it has enough class to make you willingly disregard its faults, and is far ahead of the curve in terms of recent Korean efforts to contemporize period pieces for the younger viewers. Pathfinder Home Entertainment. NTSC Single Layer. Region 1. Audio: Korean 2.0 Channel. Subtitles: English. Retail Price $24.98. Supplement: Trailer. 1 hour 42 minutes. Street Date: September 9, 2009. 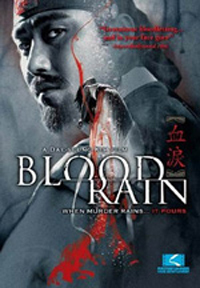 "Blood Rain" was released four years ago in a fancy mock mother-of-pearl inlay box edition through Cinema Service. That Region 3 DVD still had some minor transfer problems with overly bright contrast and edge enhancement. Pathfinder's terse Region 1 edition inherits all these problems and makes them worse by significantly lowering resolution. The video fairly crawls with random video noise, although colors do not seem to suffer too much. Audio is an okay two-channel stereo that performs basic tasks but is decidedly inferior to the Korean DVD's DTS 5.0 audio. Subtitles seem to replicate the ones prepared for the Region 3 release: quite competent, with only a few subtle mistranslations, more often than not involving archaic vocabulary used by the film's literati. They are also non-optional. No supplement other than a really horrible-looking trailer is included. Although I am glad Pathfinder has released this sleeper hit stateside, the quality of DVD is just enough to squeeze by the "adequate" mark. I also think they are not clear on the concept of this film, judging from the blurb on the cover that touts "gratuitous bloodletting" and "in-your face gore." I agree that "Blood Rain" IS gory in places, but its intricate mystery plot is likely to bore the young gorehounds stiff.